These standards, which are regarded as the most stringent of all energy codes, were adopted in response to a legislative mandate to reduce California's energy consumption. They help conserve electricity and natural gas and prevent the state from having to build more power plants. ln fact, Title 24 has saved Californians more than $74 billion in reduced electricity bills since 1978. 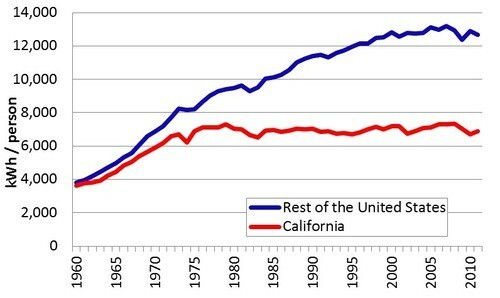 California's per capita electricity usage has stayed largely flat since the mid-70s, largely due to the Title 24 energy efficiency standard, while the average American's went up by 50% (see graph below).